Your latest novel has a young college student, Darby, traveling home to see her dying mom. So you are already feeling for this character, then, a snowstorm, an uneasy rest stop, and no cell reception, leaving her already with a lot of obstacles. Where did you get your inspiration for NO EXIT? Why a rest area? 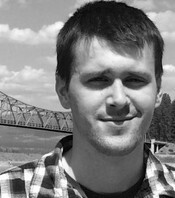 TA: I’ve spent several years driving to and from college, from Seattle to Spokane. It’s not a particularly long or harrowing drive, but there are quite a few rest areas along the way, and some of them are fairly remote, and can be quite unsettling when it’s late at night and you’re alone (or at least, you hope you’re alone!). Most everyone seems to have a personal horror story about an iffy experience they’d had at a rest stop, so as a setting, it seemed like an untapped resource for a thriller. Reading this novel had me scared of just the local Sheetz at the rest stops nearby. This is one that really sticks with you. I personally thought of Stephen King when I was reading your novel. Are there any authors that you read over time that influenced you to write such psychological thrillers? TA: Stephen King, definitely! Whether it’s a sentient car or the family Saint Bernard, I’ve always admired his effortless ability to locate the terror in the ordinary. I tried to ground my story to the mundane in a similar way, and hopefully succeeded at making door hinges a little scarier! Other authors who’ve really inspired me over the years are Stephen Hunter, Scott Smith, Dean Koontz, Joe Hill, and Gillian Flynn. I just ordered your first two novels after finishing NO EXIT. 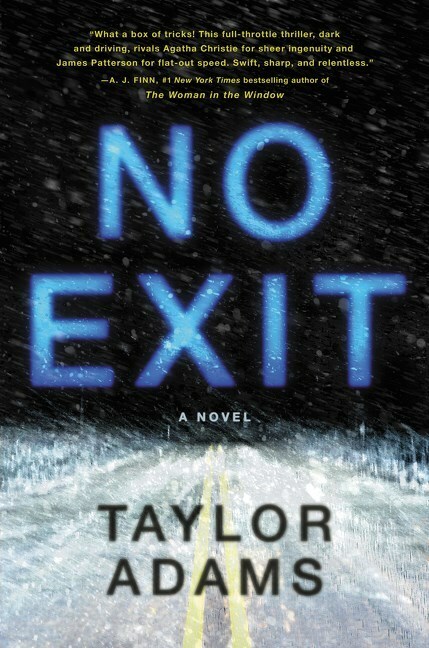 I love the eeriness your stories give and the surprises that you had in NO EXIT just kept coming. I’ve never read another author that could keep me shocked as you did on every page like that. Which is why I love this novel so much. How much research goes into a novel when you write? How do you come up with this stuff? TA: Much of the flavor comes in rewrites. I like to use bursts of research to jump-start my imagination whenever I’m feeling stuck – I’ve been to Colorado only once, so I read about the setting, the weather, and studied photos and maps. I watched some surprisingly informative videos on YouTube of people testing the penetrative abilities of nail guns. In the name of research, I did also stick my hand in a door hinge, but I didn’t close it very hard. I read somewhere that this might be a movie. Is that correct? As I was reading it I thought myself what a great thriller this would be to watch! If so, who would you cast as Darby if you could? TA: Yes! 20th Century Fox bought the film rights, with Scott Frank (screenwriter of Logan, Minority Report, and many other great films) attached to produce. I’m extremely excited. As for casting – this may be a cop-out answer, but I honestly don’t know who I would cast as Darby. I already have a fairly solid mental image of what she looks like from when I wrote the book, so it’s tricky to think of an existing actress instead. The characters seem so real, and one in particular, who I will not mention the name of so I do not give anything away to those who haven’t read it yet, but he really scared the mess out of me! He not only fooled me, but he seemed like he could have been any regular guy that we might know. You wrote his character incredibly well. Do you come up with the idea of the characters first or the storyline? TA: Thank you! It’s tricky to separate the two in this kind of tightly-focused book, but I would say I came up with the storyline first, since the story is essentially the situation the characters are working against. That said, even when the premise was in its infancy, I still had concrete ideas of what I wanted to do with the cast of characters. For example, I knew from the start that a rest stop thriller was the perfect story to feature a total sociopath who could still hide comfortably in plain sight! There are some questions I always like to ask, such as in your spare time, what is your favorite thing to do? Other than writing. TA: Aside from reading, I love playing video games. Hear me out – video games are maturing as a storytelling medium! For an example, I’d point to Frictional Games’ horror- masterpiece SOMA, a harrowing first-person tale that poses existentially-troubling questions about how we define human consciousness. Do you read thrillers yourself? Are there other types of novels you like to read? TA: I love thrillers – the higher the concept, the better. I’ve also got a soft spot for supernatural horror. I’m also finding myself developing a taste for nonfiction – Jon Krakauer’s Into Thin Air is devastating. I’m about to dive into Ann Rule’s The Stranger Beside Me next, and I can’t wait! Can you tell us about anything that you are working on next? TA: Another thriller, naturally. This one involves a remote bridge, a suspicious suicide, and a nonlinear narrative. I’ve never told a story out of chronological order before, and as challenging as it is, it’s a bit like discovering a whole new toolbox for suspense. I’m having a lot of fun. I love reading series. Finding that one character that you can relate to. Have you ever thought about doing a thriller series? One last question. My full-time job is a teacher. For fun, is there any teacher that has inspired you and how? Alarming, astonishing, and the most fearing novel yet! A traveler’s worst nightmare — trapped at a rest stop in a blizzard with criminals, but who is the criminal?